The space age marked the first time humanity had ever glimpsed its world in full. Images of Earth suspended in space like a "blue marble" conveyed our planet's fragility and mankind's oneness in ways that words could not. One such image, taken by the crew of Apollo 17 in 1972, is one of the most widely distributed images in history. 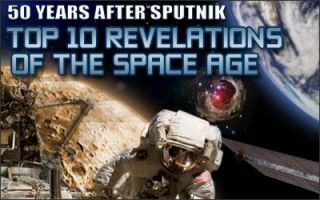 Sputnik's legacy isn't all rosy. It also heralded an age of paranoia, when people lived in fear that they could be targets of missiles hurled from across the world. The same technology that launched a satellite into space could also be used to chuck nuclear warheads at your enemies from a continent away. Sputnik would be proud. Whereas it could only orbit Earth, its robotic descendents have explored nearly all the major worlds and moons of our solar system. They've flown through the tails of comets, performed kamikaze crashes into asteroids, and some are on their way to leaving our solar system altogether. Humans had studied the heavens for centuries before Sputnik, but astronomy didn't become a precision science until the space age. COBE provided the first accurate measurement of the cosmic microwave background and established the Big Bang Model as the premier theory for how our universe began. Its successor, WMAP, dated our universe to 13.7 billion years old - ending a decades - long guessing games and found evidence for totally mysterious dark matter and dark energy, opening new cans of worms for future space-based observatories to look into. Exploding stars, colliding galaxies, shrinking planets, ravenous black holes, and much more have been vividly revealed to human eyes only since space-based imaging became possible. Documenting the cosmos in X-rays, visible light and other wavelengths of the electromagnetic spectrum as can only be done best from above Earth's atmosphere, Space Age technology has revealed our universe to be a much stranger place than scientists had ever imagined. Sputnik helped make science cool again in America. Its launch served as inspiration for an entire generation of students and led to massive federal funding increases for scientific research and education in an effort to match Russia's technological prowess. That trend has reversed lately, however, and scientific literacy levels in the U.S. have dropped to worryingly low levels. If our world seems smaller today than it did a few generations ago, it is largely due to advances in communication and information technology made possible by orbiting satellites. Humans can now know exactly know where they are; communicate with each other across continents and oceans; and control robots on distant worlds. Not to be outdone by the Russians, President Kennedy promised in 1961 that the United States would have a man on the moon before the decade was through. Neil Armstrong made good on that boast when in 1969 he set foot on the lunar surface and took "one small step for man, one giant leap for mankind." By launching into space and returning back safely, Yuri "Cedar" Gagarin proved that humans could survive in space. Scientists had previously speculated the human body could not function properly in a zero-G environment or survive bombardment by cosmic particles. Since Gagarin, 462 other lucky people have flown in space. Shortly after Sputnik's launch, American scientists led by James Van Allen discovered a ring of high energy particles encircling Earth. The finding was arguably the first major scientific discovery of the space age and confirmed Earth had a magnetic field shielding it from the solar wind. Scientists now know there are actually two radiation belts, both of which can be hazardous to satellites and astronauts.